Zak McKracken and the Alien Mindbenders is a game set in 1997, which was 9 years into the future when the game released in 1988. Zak McKracken is a tabloid reporter who, along with an alien archeologist and two college students, must unfoil an alien plot and save the Earth. Zak McKracken is now supported by ScummVM, a program designed to let 2D adventure games run on multiple platforms. With ScummVM, Zak McKracken now runs on modern versions of windows, as well as Linux, Mac OS X, and many consoles such as Dreamcast, Wii, PlayStation 2, and PlayStation Portable. For a complete list of platforms supported by ScummVM, see here. 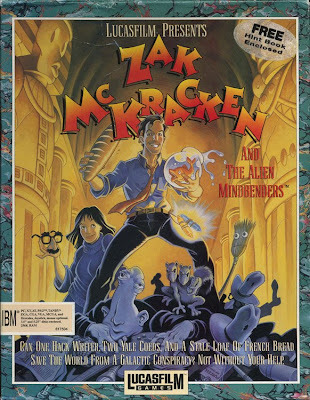 The retail versions of Zak McKracken and the Alien Mindbenders are out of print, but you can purchase the game digitally at GOG.com (it includes both the EGA DOS and 256 color FM-Towns versions).